Cheaper flights often mean traveling lighter. A travel backpack is a great option for such occasions. It might be your only luggage or even serve as a carry-on to your checked bag. Either way, finding the best tumi backpack should be your go-to choice for travel gear. Not only are these bags stylish, but they are also made with high-quality materials and offer durability. Plus, the Tumi brand is known for being a dependable purchase. We like versatility in our choices. We have several recommendations to help you pick out the best Tumi backpack (or tote) for your needs. A Tumi backpack for less than $100? Say it ain’t so. Indeed, the Tumi Voyageur Just in Case costs just less than $100 and can fit on top of your retractable Tumi luggage handle for maximum maneuverability. While you won’t be able to carry everything you need for a week in this backpack, the Voyageur is perfect for overnight trips, land excursions when taking a cruise, or a small airplane carry-on. You can even fit a 13-inch laptop inside this backpack, but it doesn’t have the padding so be sure to pack your laptop inside some other soft material. For quick access to your important documents, there’s also a small front pocket. 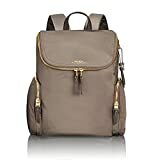 If you are looking for a backpack with a bit more storage, you can’t go wrong with the Tumi Women’s Voyageur Backpack. It consists of one main compartment with double-zip entry, and two side zip pockets which are great for storing small travel essentials that you would like easy access to (think chap stick and gum). The backpack straps are padded and adjustable, and the leather top grab handle makes this bag easy to grab off of the floor to move. It has a 12” laptop pocket, and comes in eight fantastic colors ranging from neutral black and tan to vibrant red and statement-making pink. This backpack almost looks like a hybrid backpack/purse, which makes it a stylish addition to any travel wardrobe. Another popular Tumi backpack series is the Alpha Bravo line. With several different options to choose from, the Tumi Alpha Bravo Nellis is one of the best in the lineup. Whether you need the Alpha Bravo Knox for personal or business travel, the versatility of this Tumi backpack will amaze you! If you currently use a travel briefcase, even an expandable one, you will be well pleased with the Bravo. It even comes with an exterior water bottle pocket for extra convenience too. 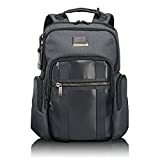 This Tumi Alpha T-Pass Business Class Brief backpack is small enough to not slow you down when traveling for business yet large enough to hold a 15″ laptop inside. The rear side laptop pocket is easy to access when you need to take your laptop out to pass through airport security. Additional exterior pockets include a waterproof water bottle/umbrella pocket, ticket pocket, and the T-Pass sleeve that lets your backpack pass through the retractable luggage handles of your checked bags. Besides holding your laptop, the interior storage also lets you bring any additional meeting materials you need to bring along. This is the best Tumi backpack for short business trips. The Alpha 2 bag is made from 100% nylon and can also be attached to a retractable luggage handle for easy transport. Some travelers prefer a roll-top backpack for their unique design. The Tumi Alpha Bravo London offers a roll-top flap to access the main compartment and a second pocket for your 15″ laptop. Having a flap instead of a zipper compartment lets the backpack expand vertically when you want to stack your travel gear and don’t want a backpack that can quickly be too round to fit inside a storage compartment or underneath a seat. If you’ve never used a roll-top backpack before, just remember that looks can be deceiving–this Alpha Bravo Luke holds more than you think. This backpack is a good option for shorter trips and has plenty of space to hold your clothing, personal hygiene items, and tech gadgets. The ballistic nylon offers additional protections from wear-and-tear and sufficient waterproof protection to protect your valuables until you can find shelter. Most backpacks are made of nylon or canvas, but if you are looking for a slightly thicker, more rustic looking pack, you can’t go wrong with this leather bag from Tumi. It features several pockets for optimal storage, including the main compartment, a front U-zip pocket, a front straight zip pocket, and two side zip pockets. This way you can keep all of your items separated and well organized. It also features a 15” interior laptop compartment, an iPad pocket, and three open pockets. 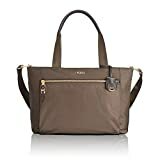 The brown and black leather gives it a classic look, with Tumi promising that the bag can work perfectly for business, school, commuting, and travel. This is a great way to carry on your essential travel items and a beautiful best Tumi backpack option. With so many different backpack designs to choose from, it’s hard to find the best Tumi backpack at first glance. 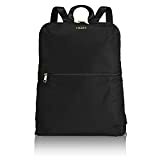 These other Tumi backpacks and bags are also excellent recommendations that might be a better fit for your travel needs. If you only need a laptop tote to easily take along on the plane or carry into a meeting without the bulky weight of a full-size backpack or briefcase, the Tumi Voyageur Small M-Tote fits a laptop in its main compartment. You also have two open pockets to hold your other business items. This tote also has a rear slide-through strap that can be secured to a retractable suitcase handle. Another expandable travel briefcase is the Tumi Men’s Alpha Bravo Charleston Compact Brief Briefcase. It holds your 14″ laptop, but it’s more optimized for 11″ and 13″ laptops. Large tablets will also comfortably fit if you need more space. As the Charleston is a compact brief, it’s not as large as some of the other Tumi travel briefcases. It’s a solid option if you want Tumi quality without needing a backpack large enough to bring everything plus the kitchen sink to your meeting. 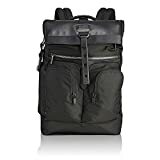 If you aren’t quite sure how you feel about backpacks, or like being able to mold your items as needed, then this convertible piece from Tumi is ideal for you. It can be worn as a stylish backpack, or as an over the shoulder crossbody. It features a single zip entry to the main compartment, which sits right on top of the bag, and a front U-zip pocket for smaller items. This style works beautifully for both a backpack and a cross body bag and even features a stylish key ring that makes your bag distinctive. It comes in four beautiful neutral colors, which means it will coordinate well with nearly any travel outfit. 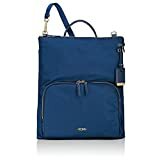 You can easily use this bag as a backpack during travel, and then as a crossbody for a night on the town at your final destination, making it an incredibly versatile piece. 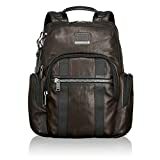 Tumi is known for the excellent build quality and design. Once you know what is best for your travel needs, you can narrow down which is the best Tumi backpack for you. These backpacks are sure to withstand the rigors of travel and are well-known for it. You really can’t go wrong with Tumi.